Phew, that was close. A very good game played in the right spirit, well refereed with the result always on a knife edge. The game developed into a clash of the packs especially in the 2nd half but was always absorbing. Chobham/ who have been Reed’s bogey team for a number of years came with their usual strong pack, sniping No 9 and their off-side at ruck/maul play down pat. They are very good at 9 man rugby. The game started poorly, bad kick-off followed by a charged down clearance, rescued at the last moment. From the ensuing scrum Reeds settled and their play gradually picked up. The routine for the 1st half was set. 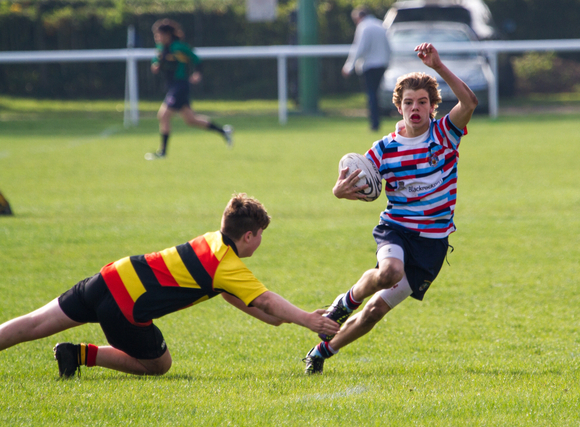 Chobham played to their pack while Reeds played as a total unit – forwards & backs. With the pack winning good ball the backs became expansive. Alfie & Isaac were both stopped on the line by good tackling. Both moves started on halfway and the ball travelled through all the backline. Olly T was similarly thwarted chasing a chip kick, he ran out of space. Reed’s kicking game was working with good touch being found on each occasion. Once again the line-out worked well. This was the pattern for the whole game. There was one poor throw and one very dubious ‘not straight’ call by the referee. Callum’s throw-ins were accurate and gave the jumpers ample time to catch and set. Their line-out started well but slowly fell apart during the game as Reeds contested their throws with ever increasing success. Chobham seemed confused by Matt being the main offensive jumper and Jamie being the main defensive jumper. Midway through the first half another good maul produce quick ball, fed along the line to Jamie on the overlap who strolled in for the 1st try. Unfortunately Mat missed the conversion, sadly something that was repeated all day as neither Mat nor Ethan had their kicking boots on. Like last week’s game Reeds lost intensity and some concentration. Chobham scored a good forward try in the corner and then were gifted a second soon after. One try was converted and so a lead of 12-5. Again Reeds gathered themselves and took control. The pack gained a slight ascendancy and started to pound the Chobham line. Just before halftime the pack drove over for a pack try. A second pack try was stopped on the try line and the referee’s half-time whistle. Things looked good but Chobham were leading against the run of play. The 2nd half started with 3 positional changes in the backs and the huge disappointment of an intercept converted try in the 1st minute. Suddenly the score was 10-19, playing uphill and into the wind. From this point the game changed. Chobham’s attacks became few and far between and the Reed’s pack slowly but steadily got on top. Midway through the half the most unusual event of any game happened. The pack won a ball against the head which showed their dominance. The line-out except for the referee’s dubious call never missed a beat and their line-out faulted. The decision was made to make it a total pack game. Andre & Ethan kept the pack moving with good grubber kicking or good line kicks to put the pack on the front foot. The game became a contest between whether Reeds would score the points or time would run out. Chobham were done, time was the problem. Another series of close mauls to the line lead to Morgan, on the outside stretching for the try. Reeds’ intensity, concentration and grit were up, the score 15-19. By now the pack had total controlled, pressure on Chobham relieved only by dropped ball or silly penalties. Chobham were too tired to even play their off-side game. In what should have been the last minute the pack again scored a pack try gaining Reeds a 20-19 lead. Unfortunately the referee’s watch stopped, admitted by him, so about an extra 6/7 minutes were played. Chobham didn’t get into the Reeds’ half as the pack simply controlled the game. It was game of two half’s. 2 lapses in concentration changed the game but the determination to grab the game by the scruff of the neck, dominate and win was very impressive. This is only the 2nd hard game Reeds have had and both times the team found a way to win, something all good teams do. Due to a smaller than usual squad players, some had to play with niggles and injuries and in different positions, thanks to Andre, Olly T & Mat in particular. Good win, now time to move on to the next training session. As Tim/JT would say it is time to take the lessons we learnt from this game, refine them, improve on them and put them into even better practice. See you all at practice on Wednesday, bring your best attitude with you, it is getting serious.